We’ll get you and your little dog too! 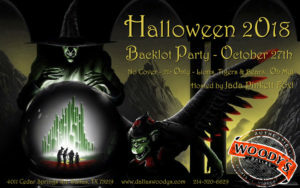 It’s the 10th Annual Woody’s Halloween Backlot Party! Step off the strip and enjoy the best party during the block party with Jada Pinkett Fox and DJ Spencer for a fun holiday filled evening in our Wonderful Land of OZ! Keep in mind you must be 21+ with valid ID and no outside drinks permitted. Did you vote early? Dedicated election day voter? This is your civic celebration! 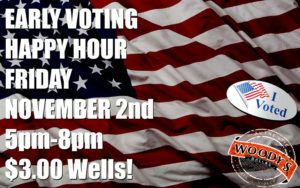 Early voting Happy Hour starts at 5pm with $3.00 wells until 8pm! Meet fellow early or dedicated voters for a great time! Happy Hour prices available to everyone who enters but keep in mind folks may discuss a bit of politics…be civil, be respectful. The Cowboys return from their bye week by hosting the Tennessee Titans! We’ve got all the action in HD with full sound and $3.50 Wells for this Monday Night Game! Stick around afterwards for 90’s night with Spencer! 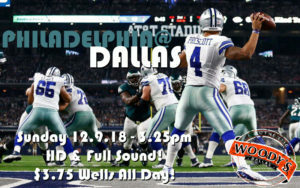 Cowboys Watch Party with $3.75 Wells and Domestic Longnecks! Can the ‘boys win back to back away from home? 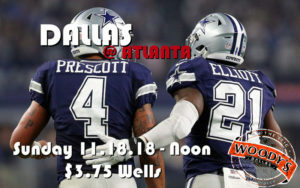 Catch all the exciting football action as the Cowboys travel to Atlanta for a pivotal game against the Falcons! Will this be a repeat of the last game vs the Falcons or are the ‘boys ready to take control of the East? Find out as it happens here at Woody’s! 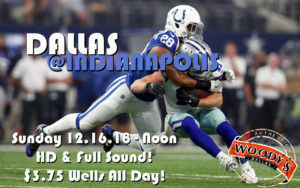 Come on in and cheer on the Dallas Cowboys Thanksgiving tradition. 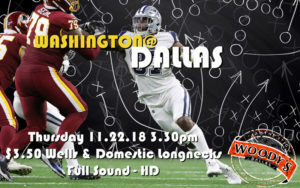 This year Washington visits for what should be an exciting game for battle of first place in the NFC East. Roaring cheers or nail biter? You won’t know unless you’re here! $3.50 Wells and Domestic Longnecks ’til 8pm! It’s the game of the season for the Cowboys as the one loss Saints visit ATT Stadium! Can the ‘boys win the game and control their own destiny? Will the game be all about who dat? 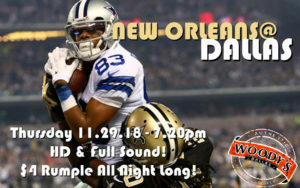 Be here to see all the action with $4 Rumple! Immediately Followed by the famous Jada Pinkett Fox Variety Show! Cowboys, Mavericks, Dallas, Basketball! Oh My! 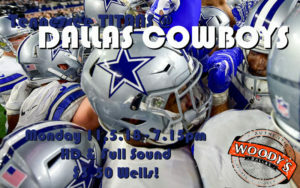 Jello shots and 50/50 Raffle during the Cowboys Game from the friendly men of the Dallas Lonestar Basketball League. Hey, you could win Mavs tickets too! $3.75 Wells and Domestic Longnecks. Holiday season is cheering up…will the visiting Eagles bear gifts or a lump of coal for the ‘boys? Be here to see it all in HD and Full Sound! $3.75 wells and domestic longnecks! 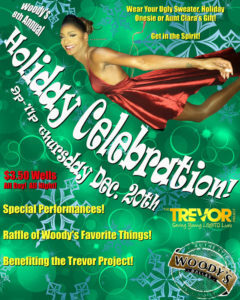 Break out your ugly sweater, onesie, holiday suit or other holiday gear for Woody’s 8th Annual Holiday Celebration with all our Favorite Things benefiting the Trevor Project! The show kicks off at 9pm with host Jada Pinkett Fox and a cast of entertainers who will raffle off all of Woody’s Favorite Things. All funds donated will benefit the Trevor Project. Plus we’ll help the party along with $3.50 Wells All Day and All Night! 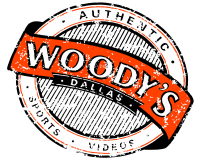 Merry Christmas and Happy New Year from all of us at Woody’s!